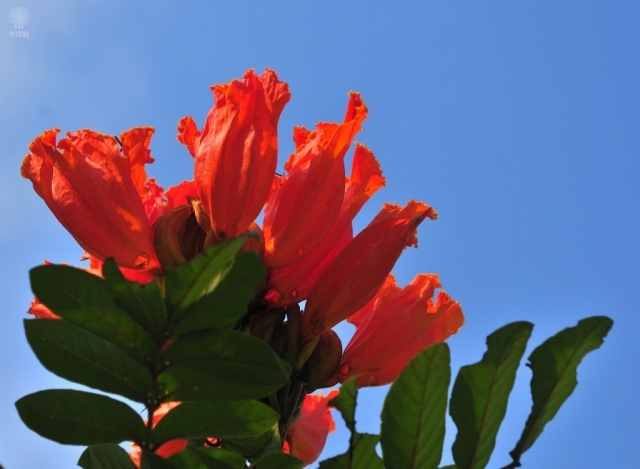 SPATHODEA CAMPANULATA - AFRICAN TULIP TREE. Spathodea danckelmaniana, Spathodea nilotica, Spathodea tulipifera. African tulip tree, flame of the forest, fountain tree, fireball, Afrikanischer Tulpenbaum, baton du sorcier, tulipier du Gabon. Originally from Equatorial Africa, the evergreen African tulip tree can be found abundantly in Suriname; it is a spectacular flowering tree. It is a fast-growing, about 80' tall, ever-blooming tree. The wood is known to be very soft and brittle. The trunk is light gray and somewhat buttressed. When young, the leaves are bronze; deep glossy-green at maturity. Large clusters of velvety, bronze-green, kidney-shaped buds are to see at the ends of the branches. Flame of the forest is an ornamental tree in the tropics. The unopened buds contain water, which squirt when squeezed or pierced, for instance by birds. Out of each bud come, large orange-red flowers and because of those the tree is planted as an ornamental. The many seeds (about 500) are in an 8" long legume that breaks open when it falls from the tree. The seeds are very small with transparent winglets. There is a rare yellow variety of the African tulip tree called Lutea. The bark and leaves are used in traditional medicine in Ghana. Bark is used in wound healing and especially burn healing. The bark and leaves shows a wide spectrum of antibacterial activity including anti-malarial activity. Aqueous alcoholic decoctions of the leaves shows promise to be used for the treatment of malaria. The stem bark decoction has shown hypoglycemic activity in mice. USDA zone 10 - 11. Full sun; moist rich soil, has some salt tolerance, foliage will be killed at 28 - 30° F, but the roots survive down to 20° F.
These tree are grown for shade and tropical effects. Plant in frost free areas and/or protect from frost.